Ruthie and Christopher man CSU's Bike Week pit stop at Menlo and MLK Blvd. For reasons unbeknownst to me, I had a hard time figuring out what time the South L.A. Bike Week Pit Stops would be up and running today. I took a gander at the pit stop map and promptly devised a route in my head so I could hit all of the South L.A. stops. I had missed what turned out to be an epic exploration ride led by CICLE’s Dan Dabek along the Expo Line bike lane on Wednesday because I woke up feeling very sick. So, I was determined to get out and support the South L.A. organizations offering pit stops for riders on Bike-to-Work Day. So determined was I, in fact, that I did not pay attention to the times listed that the stops would be offered. I’m sure I saw the times listed on the map (of those that were there — some were not). But I must have ignored them, assuming that bike-to-work hours would coincide most closely with the morning rush hour, i.e. the hours that people go to work. 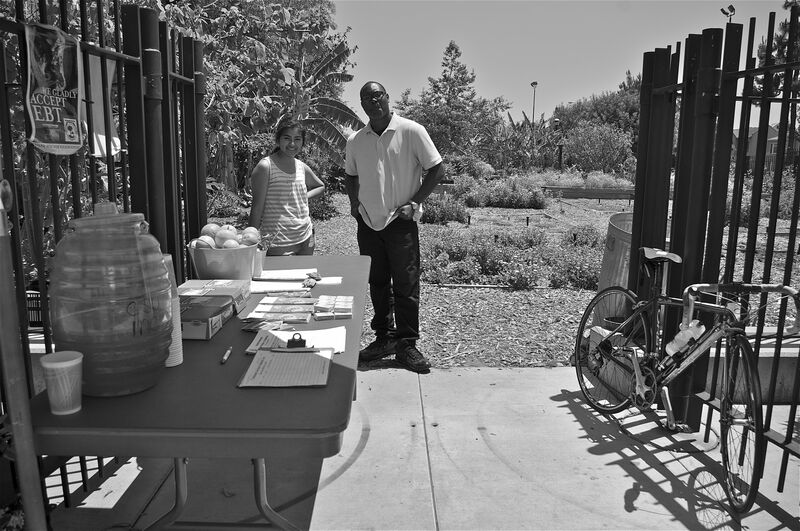 I rode down to Community Services Unlimited’s (CSU) Expo Garden stop to find no one there. A little sleep-deprived, I came to the conclusion that perhaps I had missed it because it was now 8:30 a.m. and headed for the City Lites‘ site at 84th and Vermont. The security guard looked at me like I was insane. Great, I thought. I’m 0 – 2. Either I AM actually insane or I am dumb and I got this all wrong. I must have looked forlorn because an older gentleman riding his BMX on the sidewalk stopped in front of me and asked if I needed help. Then he said he liked my bike. I asked why he was riding on the sidewalk. Vermont Avenue is about eight lanes wide, with the main lanes and the service lanes. Yet, few of the folks I see riding actually take advantage of all that road. “Oh, yes!” he said excitedly, explaining that just yesterday someone coming out of an alley had jumped in front of him. He knocked the pedestrian off balance and somehow they ended up hugging each other to stay upright. “You have to be careful!” he concluded. From Vermont Ave., I headed over to the WLCAC at 109th and Central Ave. in Watts. The East Side Riders (ESR) did receive some Clif bars to hand out, but they had none of the accompanying paraphernalia that Metro had been giving out. Without a banner to advertise the stop, the maps, or patch kits, the ESR didn’t have an easy way to let people know they were hosting the stop or link it to Metro or cycling. Thus, although it was great hanging out with the men of the ESR and discussing plans for their Friday night ride, it was a little depressing that the only people stopping by for refreshments were the guys that worked on the grounds of the WLCAC. It wasn’t until I headed back up to CSU’s stop around 12:00 P.M. (their scheduled time to begin), that I had my first encounter with a genuine pit stop, run by apprentices Ruthie and Christopher. But by that time I had to be somewhere else, so I couldn’t stick around to enjoy it. Fear not. Tomorrow, I shall redeem myself. Metro and non-profit Safe Moves are hosting a Bike-to-School event at 7:00 A.M. at New Designs Charter School at 2303 S. Figueroa Way. There are a bunch of activities for kids, including safety workshops and a visit from 2000 Olympic Team Cyclist Tony Cruz. That’s all well and good, but the real draw for me is the meet-and-greet with life-size traffic sign costume characters. If I’m going to hop on my bike at 6:00 A.M. to be somewhere for work, I want to see dancing stop signs. You should clarify – so that no one misunderstands – that as long as you are over 18, you do NOT need a helmet to ride in the road. Hi @twitter-91901078:disqus –thanks, that’s what I told him. But I should make note of that in the piece, too. I actually don’t know if he thinks that or if that was an excuse. There is just a sizable subset of people who prefer riding on the sidewalk for reasons I’m still trying to figure out! @ sahra: People prefer riding on the sidewalk because it’s safer than riding in the street, especially in mixed traffic. Yes you have to be alert for pedestrians, but no more alert than you have to be for cars and car doors when riding in the road. Assuming the sidewalk isn’t crowded (and honestly, how often do you see that in LA), pedestrians are usually more than happy to share the space, whereas drivers almost always seem to aggressively squeeze you out of their way. @17f9814251c7135b57e3e604daf65b99:disqus I think that riding on sidewalks here and there isn’t a big deal. I do it to get to/from intersections where I can cross. Generally though, sidewalk riding is only safe when a cyclist is going at roughly walking speed – about 2-5 miles/hour. If you’re bicycling faster (not even racing – but 8-10+miles/hour), sidewalk riding can be, generally, unsafe – because of drivers pulling out and not seeing cyclists. Most bike-car collisions occur when drivers don’t see cyclists – so a great deal of safe bicycling practices are about bicyclists riding where we’re most visible. Drivers pulling out of driveways aren’t expecting faster-moving folks on the sidewalk, they’re more focused on faster-moving folks in the road – so, generally, if you’re bicycling fast, you’re more visible (hence safer) in the street than on the sidewalk.Also, most car-bike collisions occur where there are “conflicts”: places where a car’s path crosses a cyclists’ path. If a block has driveways, then those driveways are zones where collisions are more likely to happen. Riding in the street, going the right direction, a cyclist has fewer conflict locations (ie: only at intersections. )I think it’s fine for cyclists, especially beginners, to ride at slow speeds on the sidewalk – especially when riders are careful about watching for cars emerging from driveways… but generally, I think that it’s best/safest for most cyclists to ride in the street.